Rob Floyd of RxLiquidChef (formerly The Bazaar, Chateau Marmont) has formulated the 7 new drinks (of 8) on this menu, and he did a great job of keeping an interactive feel to match Scarpetta’s upscale decorum. While I perhaps might be able to master the names better if I were more proficient in Italian, the overall cocktail selection ensures that there’s something for everyone. 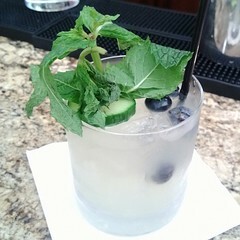 For those watching their Beverly Hills figure, the virtually no-calorie Fortuna uses stir – a raw, organic sugar substitute – to sweeten the pear-infused vodka but the cocktail still tastes delicious if not balanced, and without any hint of an aftertaste. Thanks to the Wakamono peach garnish, you may not even miss the fizz you’d find in a Bellini. Old Fashioned drinkers will enjoy the Noce, with candied pecans to nibble before each sip of pecan-infused rye. Other whiskey drinkers will love the Kentucky mule variation in the Amalfi, made with Crown Royal, ginger ale, lime and Angostura. You’ll want to be sitting at the bar to watch the Sambuca carmelization in action for the Pasione, but it’s a really elegant and delicious amaro drink as it is. It gives a really great texture to the drink, for which the base is gin and aperol. Spice and sweet lovers will want to order the Ferrari, made with tequila, Cointreau, blood orange and jalapeno. It’s got a beautifully bright color; I found the large doses of spice and sweet kind of overtook the drink, though. So now, there’s even more reason to get thee to the Beverly Canon Gardens during the mid-hours of the day. Scarpetta seems to do a great job of committing solid food and drink to this happy hour price point, where you won’t feel like you were reeled in and wanting. Like I said, though – nothing much can stop you from wanting to order the spaghetti. 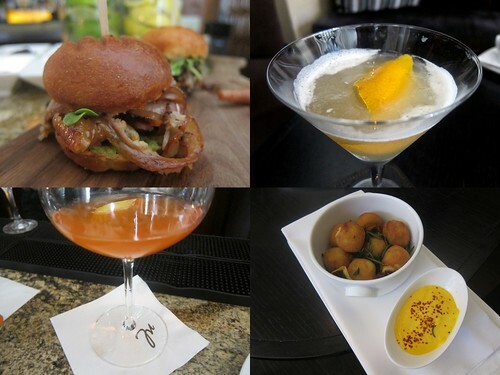 This entry was posted in Beverly Hills, cocktails, Food, Happy hour and tagged $8, Bar bites, Beverly Hills, Canon Beverly Gardens, cocktails, Freddy Vargas, Happy hour, Rob Floyd, Scarpetta, The Montage, vegetarian friendly. Bookmark the permalink.